Home / Many Voices / What's your journey? I recently took a trip of a lifetime. 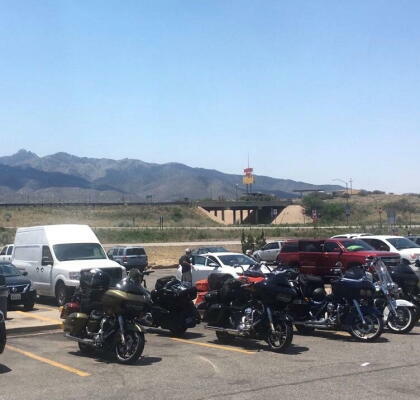 I, along with eight other men from the Raleigh area, journeyed to Los Angeles California via our Harley Davidson motorcycles along Interstate 40. The trip was amazing!!!! During the 5,667.8 miles, round-trip riding, I had the opportunity to view the amazing terrain this country has to offer. I also had the opportunity to just clear my mind and think about a lot of things. After you pass through Oklahoma and begin to see the HUGE wind turbines along the road and enter into Texas, your mind wanders, and you begin to think. I thought to myself, why am I out here? What if something happens? The people who live here are extremely remote, among other things. But looking back I realized, North Carolina has its places that are remote as well. These great citizens have some of the same challenges that the Texans have. Basic access to resources are scarce at times. So, what do we do? NCCF is set up to help mitigate these challenges. Our affiliates are established throughout our state from Manteo to Murphy. To me, they represent the various gas stations that I visited on my journey. Gas stations are scarce once you start traveling through the desert, but they are out there. We received all the resources that we needed to get along our journey. Our affiliates help provide the resources for our citizens throughout rural North Carolina, in the same way, through grantmaking and scholarships. While I enjoyed the trip, after 11 days on the road, I was ready to get back home to my family and get back to work. I needed to get back to my daily routine of providing IT support to the staff and the applicants of our grants and scholarships systems. My work here is valuable, and without NCCF, North Carolina would lose a valuable resource.